Born Mary Ellaline Lewin, in Stanley, Falkland Islands, Terriss came from a family of performers. 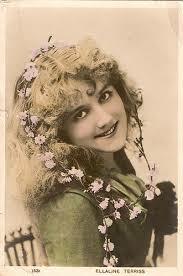 Best known for her performances in Edwardian Theatre comedies, she had a career that spanned 52 years. Her father, William Lewin, (known by his stage name William Terriss), was a well-known actor in London. Her mother, Isabel Lewis, acted too, under her stage name Amy Fellowes, and her brother Tom, was also an actor, but later became a well-known film director. 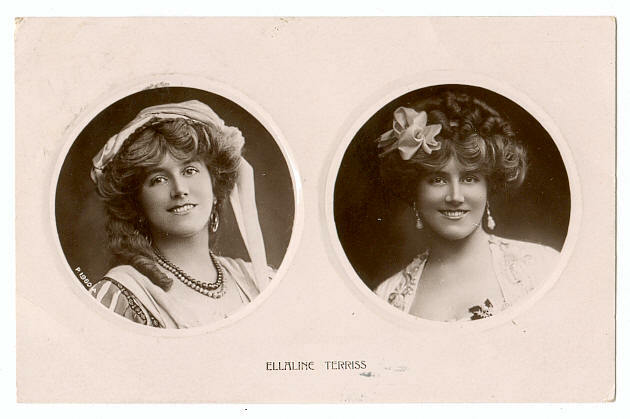 It’s therefore understandable, that Terriss had no ambition to become an actress, but performed from an early age anyway! She attracted the praise of both critics and the public, due to the fact she was both pretty and talented, and thanks to actor and theatre manager, Herbert Beerbohm Tree, she made her London debut at the Haymarket Theatre, playing the role of Mary Herbert in ‘Cupid’s Messenger’ in 1888. English actor-manager Charles Wyndham was so impressed with her performance, he gave her a three-year contract. In 1893, she attracted the attentions of young actor, Seymour Hicks and the couple were married in 1893. Terris took on several roles during the next few years, playing both supportive and lead roles, before touring America in 1895. At W.S. Gilbert’s insistence, her husband wrote ‘One of the Best’, a drama for her father, William Terriss at the Adelphi Theatre, based on the famous Dreyfus Trial. The Hickses became frequent visitors to Grim’s Dyke, as a result. Whilst playing in ‘The Circus Girl’, alongside her husband, Terriss’s father was stabbed to death by a deranged and disgruntled unemployed actor, Richard Archer Prince. Her mother died shortly afterwards. News of the murder and subsequent trial, filled the newspapers for weeks, even more famous and recipients to a public outpouring of sympathy. Over the next decade both Hicks and Terriss achieved much success, performing in both America and Britain, except when Terriss was pregnant with their second daughter, Betty, in 1904. However, the gruelling schedule took its toll on Terriss and, after 20 years, she reduced her appearances. 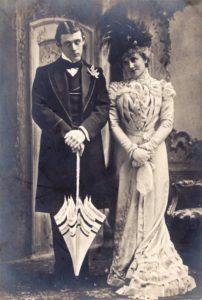 After a bout of illness, Terriss was replaced in the lead role of ‘The Dashing Little Duke’ (1909) by her husband – possibly the only case in the history of the musical, where a husband succeeded his wife’s role. The Hickses concentrated on comedy roles and music hall tours, including a tour of South Africa and France. Terris returned to the stage on special occasions, including appearing at the Lyceum in December 1925, for a French play her husband had translated and where their daughter made her stage debut – The Man in Dress Clothes. It was such a success; its run was extended. Terris also appeared in several films, making the transition from silent films to ‘talkies’ – most of which, her husband either wrote, directed or acted in. In 1940 the Hickses went to the middle east to entertain the troops in World War II. Terriss then retired from the stage. They moved to South Africa, where Terriss took up painting, under the tutorage of marine artist George Pilkington. Her works were subsequently exhibited in Foyle’s Art Gallery, London, in February 1959. Ellaline Terris, survived her husband for 22 years, before sustaining a hip fracture during a fall. This led to her death, aged 100, at the Holy Family Nursing Home in Hampstead, London.